By Alvaris Falcon in Internet. Updated on April 17, 2019 . Today, following the post 5 Steps to More Efficient Google Search, we want to reveal to you 10 more awesome features that Google can do to help save your time of searching here and there, clicking up and down, or purchasing something complicated for simple functions. In short, it helps you to achieve a more efficient and cost-effective daily life, and you just need to uncover these features by following the jump link. Let’s get to know what magic this search giant can perform then! Meanwhile, here are some awesome features of other Google services, we have got covered for you! There is time when you want to seek for inspiration, or simply resources for, let’s say, a design. You type “design inspiration” in Google, and it does its job by returning you a list of a mix of design-related sites and showcases. The problem is that once you reach to page 3 or 4, the results start becoming inaccurate. The only possible way to look for more relevant results is to dive into the showcase posts and pick the sites one by one, but this can get really time-intensive. That’s when the Related Page feature comes to the rescue. Let’s say you want to get more Photoshop tutorials, but not just those tutorials from PSDTuts. Instead of searching here and there, you can simply type “related:http://psdtuts.com” and bingo! All sites related to the primary topic of PSDTuts will pop up in the results! The feature is also extremely helpful when you want to search related sites or blogs. If you love to read a certain blogger’s articles, you could find other bloggers with the same topics and writing style as your favorite blogger by using this feature. Personally, I think this feature is very practical, but it’s best for you to embrace both the feature and your common search method, since they both return effective results in different situations. Throughout our academic and work life, we always search for the word’s definition in order to form a better conversation, a better article, or a professional report. Many people choose to get dictionary apps or electronic dictionaries, which is all right, but why not use Google if you’re looking for a quick definition? Just type in “define (word)” and Google would return to you the word definition as well as classes, possible meanings and the synonyms of the word. If you wish to understand more about the word and its usage, you can also refer to the provided links that will lead you to Wikipedia, Dictionary.com, Answers.com and Merriam-Webster. This is not limited to a single word’ you can also search for phrases like “here and there” or “here and now”, using the above-mentioned feature. So there are really a lot of stuff you can "define", and oh, did I tell you that you can define “Jennifer Lopez” or “Diablo 3” as well? So you’ve got the definition for certain terms, but you want to know more about it e.g. how does the color theory work. Searching the Web might only get you more confused with the topic since the article’s difficulty varies, but you’ve missed a helpful tool that is always hidden in your Google Search page: Reading Level. It can be activated through the “More search tools” option on the option list located at the left side of your Google Search page. 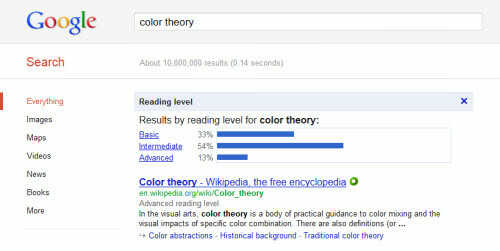 "Reading Level" will classify the search results into 3 categories: Basic, Intermediate and Advanced. If you are a newcomer to the topic of “color theory”, you probably don’t want to see something advanced like the constructing and mixing of palettes, therefore you can select the “Basic” option to know about everything elementary about the color theory. When you are more comfortable with the basics, you can go for “Intermediate” and “Advanced. It helps make your learning curve smoother! Although I believe the result is arranged by the computer’s algorithm, it does provide relevant results in recognizing a term, topic or subject, so don’t try “advanced Photoshop tutorial” to make fun of Google! Forget about the calculator in your Operating System. If you have your browser opened, you can just enter any math equation into the Google search box, and it will calculate out the answer for you! The reason that I really love this feature is the fact that it is not as simple as it might sound. You can even do complicated math calculations by entering the right equation, such as “100*3.14-cos(83)=“. 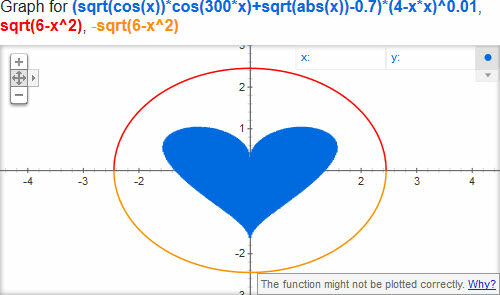 Best of all, Google will even make a graph for you depending on your math equation, and you could somehow get romantic with the numbers and equations, such as “sqrt(cos(x))*cos(300x)+sqrt(abs(x))-0.7)*(4-x*x)^0.01, sqrt(6-x^2), -sqrt(6-x^2) from -4.5 to 4.5“. Now just don’t try to cheat in your exam! When you are getting in touch or working with people living in foreign countries, you need to convert a lot of measurements to understand the conversation or the deal better. Different countries embrace different measurement system, and terms as well. There is always currency involved if you are dealing with foreign collaborators, ranging from freelancer to a company’s project manager. The accuracy of the currency involves is often a sensitive subject. In this case, Google could be your most trustworthy source to track reliable currency rates. In fact, the main reason that I use Google for currency conversion is that you get to know the currency rate instantly by typing just “1 usd to sgd” into the search box. Speed can be very helpful when you’re negotiating with your client, as sometimes the negotiation could involve multiple currency conversions. And best of all, the search engine does accept non-standard units like “rm” for “MYR (Malaysian Ringgit)”, though it’s better for you to know the correct unit to avoid confusion. Google may have published a disclaimer about how the result could be less accurate (which, in my opinion, made it more trustworthy), but there are even businessmen who grab the results and put it into the negotiation, since it’s fast and trustable to a certain degree! I’ve been acting stupid for years. Every single time I want to do a quick translation, I simply open another browser’s tab, type Google Translate’s address, then input the words or phrases, then choose the languages, then click on “Translate” without knowing that the same translation can be done in the same way through the Google Search, by just one click. It’s really intuitive, you just type in “translate (words) to (language)”, such as “translate business to chinese” into the search engine, and it will use Google Translate to do the instant translation for you. Like what Google Translate could do, Google Search could also translate phrases and sentences, though it does not support pronunciation and site translation, so these could be its weaknesses. Furthermore, if you want to have a more serious translation, you could always follow the provided link to the Google Translate for more complicated task! Now I don’t see any reason to access Google Translate, just for a quick translation! You can get possibly anything you want to know about local happenings on the Web, and search giant Google would not disappoint you on that, especially when discovering local businesses. Want to know where the nearest Pizza Hut in your place is? Just search “pizza hut (your place)” and you will get the location in your place, possibly with a map! If your place is quite big and you want to narrow down the search result, you could type “pizza hut (area code)”, for example “pizza hut 95014” and the search result will only indicate the shops in your defined area. Oh, and don’t forget to check the time, distance and direction required to reach the shop by typing “from (your place) to (shop’s name)”! Take note that some of these features could be limited to big cities only, which is kinda sad but at least it’s functional in most urban areas. Time and weather are constantly changing and it is annoying to check through any website or phone. I mean, what is the point to take out your phone and click on the button in order to check for weather, while you can check it directly on Google? For checking whether it’s quite straightforward, you just type in “(your place) weather” and you’ll get the current weather of your place, and weather forecast for the following days as well. If you want to dive into it, you can also follow the links to The Weather Channel, Weather Underground and AccuWeather to get a detailed forecast. As for time, it’s pretty much the same thing, you can just key in “(location) time” to get to know the local time of any place you want to know! The cool point is that if you’re living in a country where the time zone varies through different states, you could just type in, says, “US time” and Google will display a list of states (Chicago, Denver, Phoenix, etc.) with their corresponding time. One click for multiple results, Google’s way! 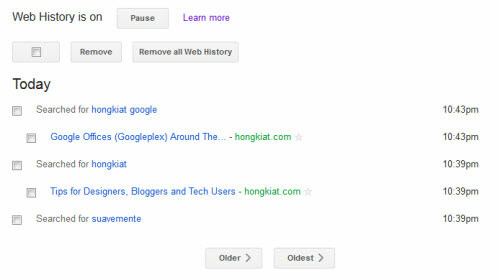 Unlike the features mentioned above, the Web History is quite passive, you don’t activate it through the search entry, but you can activate it through its page. Once it is activated, it will be able to provide you a list of useful features that further enhances your search experience, by looking into your past. To be precise, Web History is like the History tab of your web browser like Firefox, except that it stores your search history. So whenever you stumbled upon an awesome site and you forgot its name in the future, you can just track back to your web history to obtain the link again. But that’s not what’s really awesome about the Web History. What’s really great is that once it is activated, you will get improved search results as you search over time, as Google will study your visited sites in Web History and deliver you a more personalized search result. With the feature you could also understand what you are really aware of, probably even uncover another great way to discover your interest, and possibly your future direction! The Web History will verify your account with a password every time you request access to it, so the data is safe with you. Also take note that once you are signed into the Google, the Web History can be activated or accessed through the gear-like icon located on the top right side of the Google Search page, but not on iGoogle’s homepage. The greatest benefit of these features is whenever I need them, they are always there for me. I don’t need to fire up and load a software or web app, and I also don’t have to charge up my mobile phone or electronic devices in order to use those intuitive features. Though the features are quite basic, they’re easy to remember and use, and they’re pretty much enough for me to tackle my daily errands. I hope you find these features useful and applicable to your daily life! If you know of other ways you can use Google’s search engine, feel free to share your tips with us in the comments section.